What is a Profit Maximizer? Here are 5 You Should Try. The most successful businesses excel at one thing that mediocre businesses don’t – maximizing the value of their customers. We’ve all heard the saying, “it’s cheaper to retain customers than acquire new ones,” a million times. While this is true most of the time and it’s solid advice for lowering costs, it’s not really great advice for businesses that want to maximize profits. When you’ve got a Customer Value Optimization (CVO) system in place, you’ll gladly spend the money to acquire new customers. After all, your ability to outspend your competitors on customer acquisition is your biggest advantage. Let your competition worry about how to save money here and cut costs there – we’re focused on growing profits, not cutting costs! That’s where the Profit Maximizer comes in handy. The simplest way to think of a Profit Maximizer is an upsell, but Profit Maximizers come in many forms and the upsell is only one of them. A Profit Maximizer has one primary goal – to increase the average transaction value of your customers. More specifically, a Profit Maximizer is typically used to immediately raise the average transaction value, resulting in immediate ROI. While mediocre businesses are focused on a single offer, smart (and insanely profitable) businesses are creating funnels with multiple offers to maximize their profit per customer. For example, let’s say you have a $100 offer that you’ve sold to 100 customers. That’s a total revenue of $10,000. You might not realize it, but roughly 30% of those 100 customers likely would have bought a $300 offer immediately following the purchase of the first offer. That’s an additional $9,000 of revenue, nearly double the amount of revenue generated from each customer! That’s the power of a Profit Maximizer. Now imagine how your business would transform if you reinvested all of the profit from your first offer and, instead, kept the profit from your Profit Maximizer. Sure, in this example it generated $1,000 less revenue, but you’ve gained thousands of dollars that can be invested in customer acquisition, exponentially increasing potential profit. Are you starting to see why businesses like Starbucks, Amazon, and Best Buy love Profit Maximizers? More importantly, are you starting to realize how difficult it is to compete with a business that uses this model? Good, now let’s take a look at five different types of Profit Maximizers that Inbound Marketers can use to increase the value of each customer. Without this type of Profit Maximizer, McDonald’s would not only be out of business, but they never would’ve made it this far. It might surprise you to learn that McDonald’s doesn’t make any money on their Core Product, the hamburger. Well, technically they make about $0.18 profit since they spend about $1.91 to acquire a new customer. 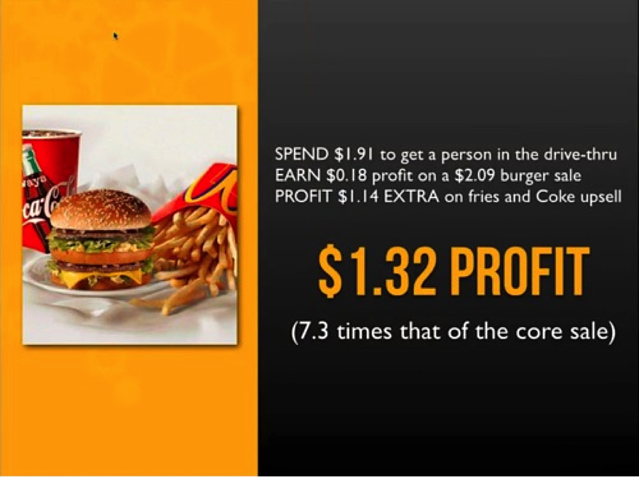 However, the fries and Coke that come in the combo meal (the Upsell) provide an additional $1.14 in profit. They’re not alone. Although it might seem like Best Buy makes their profit from 4K TVs, laptops, and gaming consoles, the reality is that they are selling their Core Products on paper-thin margins to get you in the door. Best Buy’s real profit comes from their Profit Maximizers like accessories and warranties. While they aren’t making much on the new PS4, they’re making a killing on PS4 accessories and warranty plans. Other Profit Maximizers they upsell are installation and Geek Squad support. What could you be offering as an upsell? If you sell a lot of products or services, the Cross-Sell is another Profit Maximizer you should consider. 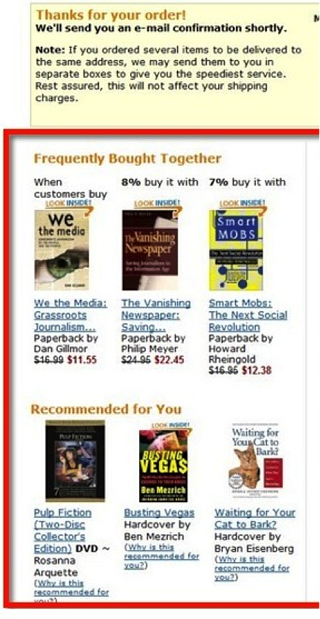 You see this in action all the time, most notably by Amazon, the king of cross-selling. Unlike upselling, a Cross-Sell doesn’t have to be directly related to your first offer, though the more related they are the higher your conversions will be. One thing that Amazon does well is pitching the Cross-Sell after you’ve added an item to your cart or you’ve made a purchase. This is important because cross-selling can be distracting and you don’t want to jeopardize the initial purchase or it defeats the purpose. 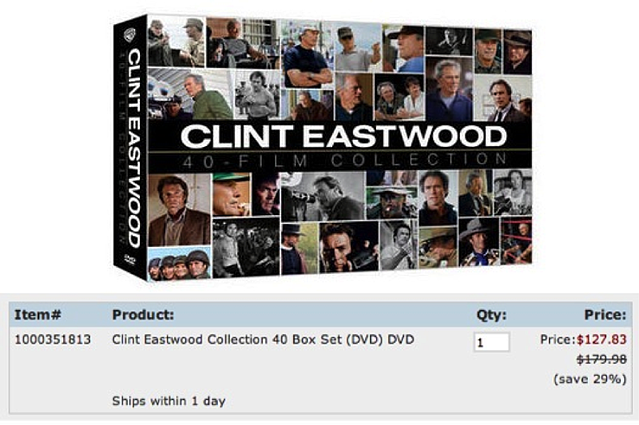 Product/service bundles are one of the timeless strategies that marketers have used for decades. They also make for an effective Profit Maximizer. Bundles are great because they work well for products and services. Inbound Marketers can especially benefit from Bundles when they combine high-margin information products with lower-margin physical products. What could you bundle with your Core Offer? Similar to a Bundle, Value Buckets maximize the value of each transaction by increasing the total quantity of items purchased. The key difference is that you’re offering a slight discount in return for your customer purchasing a higher amount of your Core Product. This works extremely well for high-margin consumable products because there’s room to be profitable at a discounted price and consumables get a lot of repeat purchases anyway – so you’re really doing your loyal customers a favor. I recommend A/B testing this offer on the sales page against the “Thank You” page to see what gets the highest conversions. The easiest way to approach this is a BOGO where they get the second item for half price. This is widely considered the holy grail of Profit Maximizers and is one of the main reasons that SaaS businesses are so profitable. Membership or subscription services are a dream for business owners because monthly revenue becomes more predictable, as does the average customer lifetime value – making it significantly easier to manage your marketing budget and know how much you can spend to acquire customers. Companies like Birchbox, Dollar Shave Club, and Netflix are all great examples of how to use this Profit Maximizer. However, we’re starting to see this trend pick up in all industries. Recently I’ve noticed car wash services even promoting membership plans. How can you incorporate a subscription or membership site into your business model? The content above was an excerpt of our new guide, "The Inbound Customer Value Optimization System (Using HubSpot)." To learn about implementing profit maximizers, creating a return path, and the rest of the Customer Value Optimization System, get your free copy of the full guide by filling out the form below.